This chart shows the time needed to close specific global gender gaps between women and men based on current trends. Based on current trends, the global gender gap will not be closed for another 100 years. These predictions are of course fluid. In fact, this year's figure is even an increase on 2016 -- in the last report, the time needed was forecast at 83 years. When looking at particular aspects of the gap, the biggest factor in the current disparity becomes clear. According to the World Economic Forum it will take 217 years to close the economic gender gap. On the more positive side, the educational gap looks set to be almost completely diminished within 15 years. 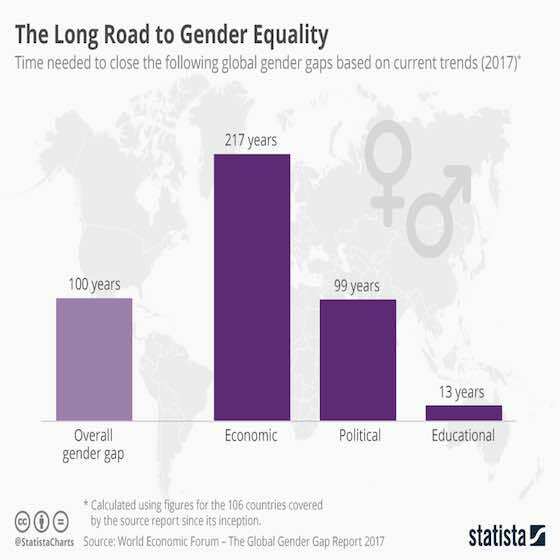 Woman to Woman: "The Long Road to Gender Equality"